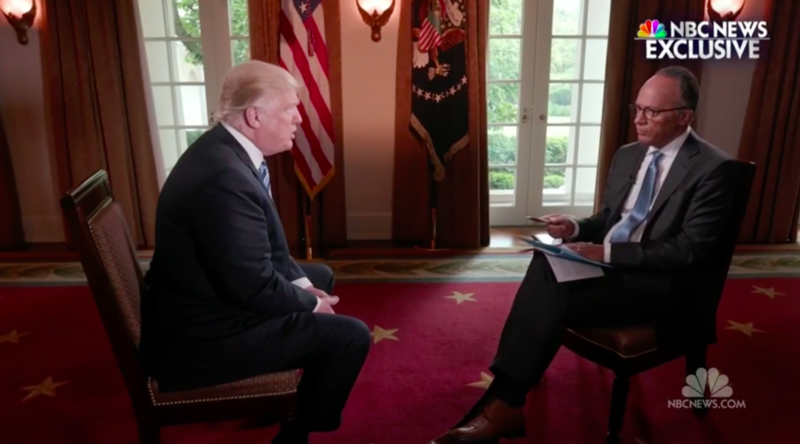 President Donald Trump denied collusion with Russia in an interview on Thursday with NBC’s Lester Holt, while defending his decision to fire FBI Director James Comey. During the interview Trump said he had been previously told by Comey that he was not under investigation, a total of three times, Trump said. But Comey publicly confirmed in March that the FBI was in fact conducting its investigation into potential coordination between Trump’s campaign and Russia. Trump blamed the Democrats for making up the story about potential Russian collusion with his campaign. In the interview, however, Trump clarified that his decision had been made before said recommendations. “I was going to fire Comey. My decision. I was going to fire Comey. There is no good time to do it by the way,” he told Holt. Trump also defended his rationale in delaying the dismissal of former National Security Adviser Michael Flynn, after former Attorney General Sally Yates informed the president about Flynn’s Russian interactions.